Entering her Master's course, Nanami Haruka is facing an even more difficult time. And she isn't the only one. The main six members of Starish are assigned new seniors to watch over them! But the seniors aren't having the best attitudes about it. Watch Uta no☆Prince-sama♪ Maji Love 2000% and find yourself completely engaged in a whole new adventure mixed in with comedy and romance! 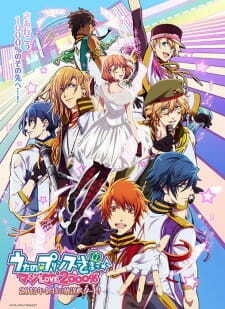 Some of you may remember me from my repressed review of Uta no☆Prince-sama♪ Maji Love 1000% . But like a moth burnt by the flame, I never learn my lesson. I'm back, baby. Uta no☆Prince-sama♪ Maji Love 1000% introduced us to some vapid and brightly coloured characters who quickly grew a place in our hearts like a shockingly virile parasitic worm. There's, you know, "her" / "thing" / "soup-eyes-chan" / "pink" (or as some call her, "Haruka"), the girl who can't sing - sorry, I'm thinking of the rest of the cast - I mean, read music. And then there's the rest of the gigolos, "hime-cut", "manwhore", "blue guy with irritating vibrato", "heart-defect-kun", "guy who voiced a prison guard in Enzai", "yatta", etc. These, our beloved friends. They have returned to us. Cecil is bored with being a cat and a grandmother and decides to enroll in Gigolo School with the rest of the cast. Unfortunately he brings with him a gaggle of other cast members. I would guess there was two dozen in all. It's difficult because they all came without their personalities. Don't forget your drinking games - drink when every new character is introduced and we'll end up colour-blind, hey girls? Along with Cecil's janitor or whatever, there's the addition of a rival gang of senpai singers (presumably they were touring the world during the first season, or at least the countries that aren't anti-LGBT). Seems like these senpais finally noticed them. Well done boys. BTW, did you know the band's official name is STARISH? I thought it was Uta Pri. Not STAR, or STAR-like, just an 'ish'. Like, you know, they're not quite celestial orbs... more like glow in the dark watch faces. This is who we're rooting for. As well as Senpais, STARISH (who knew, right?) are competing against HEBENSU for the Uta Pri Prize. Gee, with a name like that, I wonder who will win? OK, sit back, 'cos I know you've edged towards the very boundary of what constitutes a seat. Time for some spelunking in what little depth this series has. Don't worry, we won't need a snorkel. P.S. Image songs were enough to drive me to violent crime. Blue guy's especially verges on animal abuse. Depressingly high standard as usual. There's a lot less chibi this time round, obviously someone read my review. The fight scene in one episode went shounen for a while, it was an amusing aside to take me away from my crushing despair over everything this anime stands for. Less inside mist than the first series. Haruka's fashion is a bit more toned down this time round, or maybe my retinas are just scorched. Made me wish I was deaf. Saotome is pretty much the saving grace of this series. Saotome is kind of Michael Jackson meets Goku. He talks in Engrish a lot and has a (sadly late) rivalry with someone called Raging who dresses like a pimp. I am shocked and saddened that we cannot date him. All in all, 2000% no. I would have given it a 5, but due to some minor yet nice changes this part should be fair enough. Let's face it, in this anime the art is on the character's sense of fashion, though it good, it was to elaborate and elegant for a commoner like me to comprehend. Like I said, this anime is more on the musical genre so therefore the plot is only an added bonus, and I mast say I like all the songs in this anime and so as the seiyuu's who sung it. I also like Nanami's seiyuu as well and Shinning Saotome's over exaggerated tone. Character: Good 7 , I believe you....I.. Ok, Nanami maybe the driving force of STARISH, but it was the guys who has the most contribution with this anime's feature, though I could have given this part a 5, it was the introduction of Cecil Aijima that has added to the flair of the group. There is also the Sempais; Ranmaru Kurosaki,Ai Mikaze ,Reiji Kotobuki and Camus as well as the "Heavens", Ēichi Ōtori , Nagi Mikado and Kira Sumeragi who seem to be just a bunch of pretty face that were added for additional antagonist of the protagonist, We're Heaven, Yes We're Heavens. Not bad for an otome game to have a 2nd season, though the plot is lackluster, it was the songs that carry this anime's enjoyment. Though there are some predictability in this anime, studio A1 did a good job on this anime's songs and episode theme, the end. Maji Love 2000% picks up the story where the first season left off. After making their - successful - debut, they are supposed to pick up the pace and become even more successful. They are to follow a special program while pursuing their careers. I did read all the reviews before me, the general consensus seems to be that it is as good as if not better than the first season. I do not share that opinion. Story: While the story wasn't brilliant - not that I expected it from this anime - the first season, there was indeed more plot. To start with "cataract" Minami and her inability of reading sheet music, which was the leeway to her sickly childhood. There was the individual stories of every single one of the boys, from family member coldness of Jinguuji, to burnout of Hayato/Ichinose. Not only that but more importantly all those single stories got connected somehow to one fluid plot. The second season does not have fluidity. There are single episodes that deal with the members of Starish but those do not really connect to each other. Then final/highpoint arc is introduced, Heavens vs Starish, and ... no, except for my suspension point there is really no build up in the story towards the end. The competition is announced in episode 11 cataract-girl struggles in episode 12 and bum you have the - obvious and over the top - resolution in 13. Art: Except for cataract girl I really have no complaints. One could say I actually watched it for the art, as in bishounen. And yes, they are so, so, so, so very beautiful! If I could scoop out the eyes of Minami I would be ecstatic. But all things said and done, the beauty of the boys and the landscape (seriously, the schools in both seasons are like castles and the greenery and the lake, ..., I really wanna be there too!) numbs my brains and I forget about her creepy eyes. Sound: I liked the music in the first season so much better. In my opinion compared to first season the sound of second season is pathetic. I have heard more entertaining and effective jingles than the songs of the second season. And if that is not enough they are pale imitations of the first season. Characters: Maji Love 2000% is trying to compensate for the lack of plot via introducing a bunch of new bishounen. While visually considered I have no earthly complaints, I have to say, the season ended and none of those characters really helped the plot in any significant or insignificant way. They were just very pretty to look at. When they were first introduced as the sempais to help Starish members to become more "idol"y I expected for them to do something. Anything. Guide, or help at a crossroads of life or something. At the end, they were there. And they were pretty. Then there were the 3 members of Heavens. The evil act was just so funny that I have no complaints. Albeit, I am guessing it wasn't meant to be funny. Enjoyment: I did enjoy it. Because let's be honest, if you are going to watch this kind of anime, you do not have or you should not have high expectations regarding the plot. So I took it on the face value and I did enjoy myself watching all the bishounen and making fun of cataract Minami and laughing at the antics of Saotome. I was sorry to see less of Hyuga Sensei and Ringochan and Tomochan but it is understandable with only 13 episodes you cannot thin out the plot more than its already watery self. Overall: If you are in the mood something light and soul uplifting; with a plot that won't engage your brain in the least, curb your expectation and watch this. It is an anime with a lot of bishounen and beautiful landscape and acceptable sound. If your looking for an anime about singing and nothing else this is the anime for you! I came into this anime with the full intent to have a reverse harem and have her end up with the man of her life. I mean come on when you got ALL these hot boys around you how can you not help but pick one. This has been the worst reverse harem I have ever seen. This anime makes Bleach look attractive to say the least. I really with that we would have gotten more subplot. Anime like Diabolik lovers does the love and singing to a whole new level. I would say that garbage anime was also better then this anime. Thats saying a lot becaause Diabolik lovers was bad to. Hidan wished that this anime had a love story as well. In the loving words of our lover Jashin "ore me wa mou shindeiru"
When you have lime eyes with yellow in them you have a terrible time trying to succeed. Learn all about the story of the hit reverse harem series Uta no Prince Sama and why it's worth checking out.